We understand that your customers have differing and specific reasons for choosing later life lending, and we approach each application not as a case number but as an individual seeking a way to enjoy the retirement they deserve. Likewise, we understand that our actions affect you too, which is why a first class service is our number one priority. Service sits at the heart of everything we do and drives the thinking and mentality of every facet of our business. Face to Face BDMs and dedicated Relationship Managers offering award winning service to you and the customers you represent. 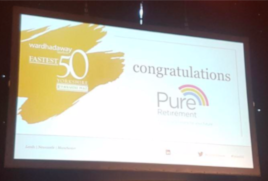 Winners of Best Provider For Adviser Support at the industry’s Equity Release Awards three years running, we are more committed than ever to our market-leading service provision. Our skilled marketing team is on hand to create and deliver a wide range of materials for you, all tailored to your specifications. From events banners to leaflets, advertorials, and digital marketing campaigns, we can help you to raise your profile with your future client base. Providing direct customer assistance, we ensure your clients receive a smooth end to end customer journey, to completion and beyond. We’re as invested in you and your customers as we are in our own people at Pure, receiving Investors in People Gold for 2018. We’ll be Celebrating Super Service over the coming months, giving well deserved recognition to companies like ours, who are dedicated to going above and beyond with their outstanding service levels. Watch our latest video to see the main features of our newly-launched mobile app, available for Android and iOS. Already a user? Stay tuned for our new feedback initiative launching soon. We're now the proud sponsors of the England National Walking Football teams, supporting active and empowered Over 50s making the most of later life. 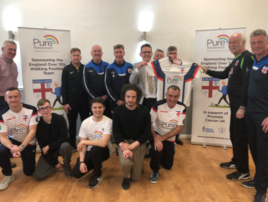 Our launch event in Barnsley was a great success, with our Pure Team losing spectacularly in a game against the pros and raising funds in aid of the WFA's charity partner, Prostate Cancer UK. There’s still time to contribute to this fantastic cause here. After last year’s win as Yorkshire’s number one fastest growing business, we were delighted to be nominated once again in this year’s Yorkshire’s Fastest 50 Awards. We’re committed to further growing and developing the lifetime mortgage market and enabling the funding of later life for thousands of customers throughout the UK. 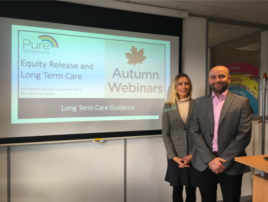 Our webinars and roadshows proved really popular last year and it's been great to see our educational resources resonating so well with our adviser network. The good news is that we've plans for more in 2019, with Spring Webinars set for April and May, and our ever-popular Roadshow Series set for 3 locations across the UK this May and June. As we continue to expand we've a number of of openings waiting for be filled by someone looking to take their career to the next level. "Professional, helpful, accurate from start to finish. Highly recommend"
"I have been very pleased with the professional and at the same time personable way Pure Retirement handled my equity release, I would not hesitate to recommend them"
Pure Retirement is authorised and regulated by the Financial Conduct Authority. FCA registered number 582621. Registered office: Pure Retirement Limited, 2200 Century Way, Thorpe Park, Leeds LS15 8ZB. Company registered in England and Wales No. 07240896.